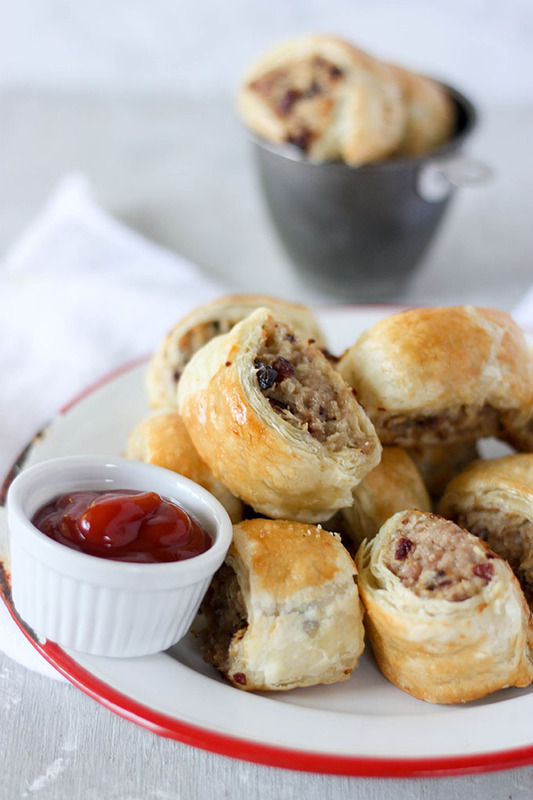 Pork Sausage Rolls – The perfect fall party appetizer, these pork sausage rolls with cranberry and goat cheese are so good, you’ll have a hard time sharing! Cooking for the holidays doesn’t have to be difficult, you just need some smart recipes that you know everyone is going to love! Push it down a hill…. 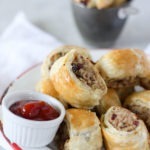 or make these ridiculously appetizing pork cranberry & goat cheese sausage rolls. Myself, I prefer the second option. Because, this recipe. OMG. I die. Don’t you just love those recipes you create, where they just happen to work out the very first time you made them? I’m a little smug about this recipe actually, because it is that good. And because I feel like a recipe like this should be way more technical than it actually is. But truth is, these are just SO easy to make, I literally whipped them up in about 30 minutes (including cooking time). 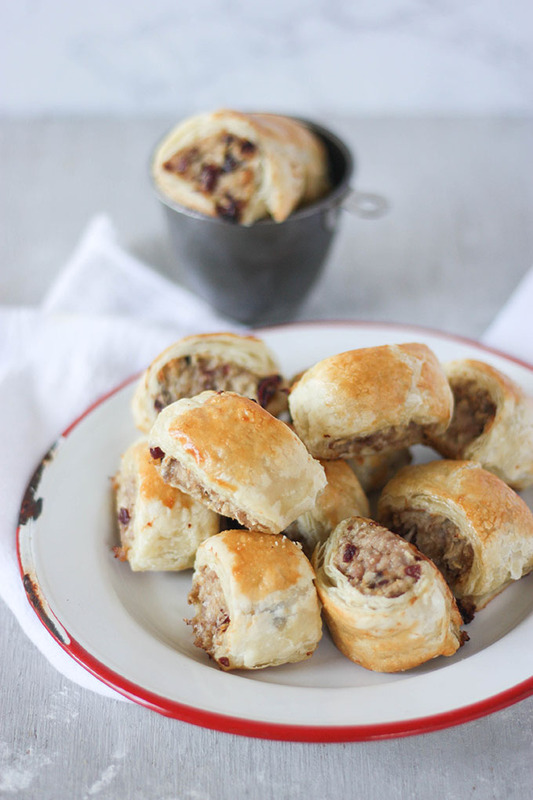 These pork cranberry & goat cheese sausage rolls are ridiculously tasty, easy to make and are SO fun for the holiday season! 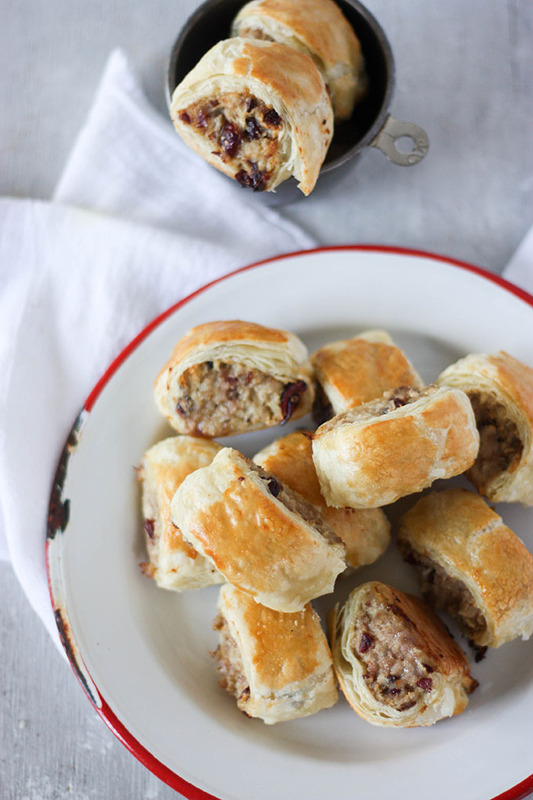 I mean, who doesn’t like mini sausage rolls as the perfect thanksgiving appetizer!? 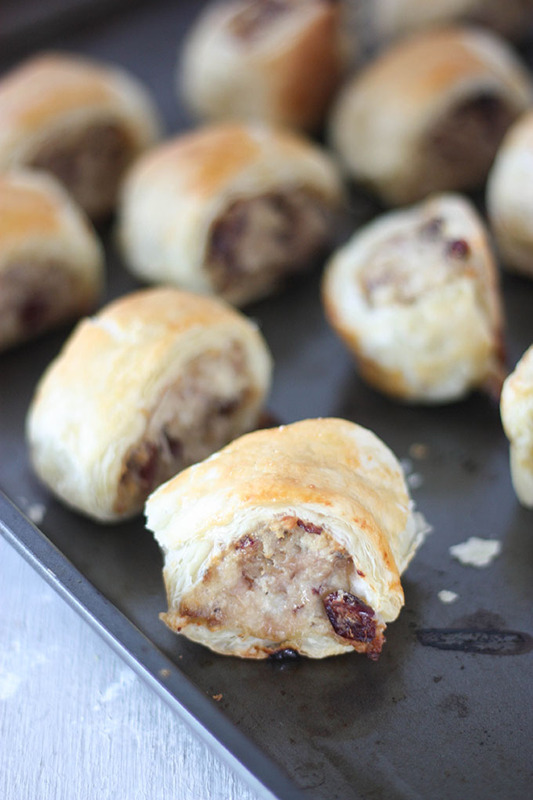 If you’re unfamiliar with sausage rolls, then you’re in for a treat. I actually read this article and laughed out loud, because I’ve come to the realisation that so many Australian/British food combinations confuse Americans. In a nutshell, a sausage roll is meat, wrapped in puff pastry. That is the most accurate way of describing one. It is also the most boring. If I want to get technical, a sausage roll is a delicious mix of sausage mince, onion, herbs and spices, and added little extras of deliciousness like fennel seeds, sweet chili sauce, the options are actually endless. Mooshed together with breadcrumbs and eggs, wrapped in puff pastry and cooked until browned and flaky. The essential part of any sausage roll encounter ever, is the serving. Sausage rolls must get served with tomato sauce aka ketchup. It’s un- Australian not to. But in all seriousness, weird food aside, these sausage rolls actually make the perfect party snack. They can be made in advanced, and reheated which is perfect if you’re travelling or need to prepare ahead of time. These pork cranberry & goat cheese sausage rolls require minimal washing up, are easy to make, no fuss and require a few simple ingredients that are easily attainable from any supermarket! So if you’re in the need for some party food, for the holiday season or for any time of the year, these should be your go to app to make! 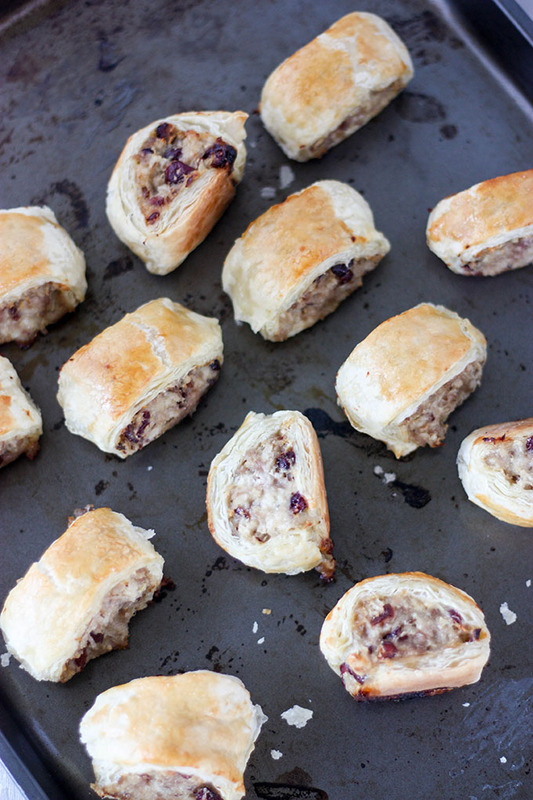 These pork cranberry & goat cheese sausage rolls will be your go to party food I promise! Delicious, and easy, stress free with minimal washing up, and they taste just as good at the real deal back in Australia! Line a baking tray withe parchment paper. Grate onion, and squeeze out excess water. Place ground pork, egg, panko breadcrumbs, onion, caraway seeds, cranberries, goat cheese and salt and pepper in a large bowl. Mix well together with hands or wooden spoon. Lay out puff pastry on a bench, and cut into two equal pieces. Get half of the filling, and lay out into a log shape in the middle of the pastry. Roll together tightly, sealing with a little egg wash mixture. Brush egg wash onto sausage roll log. Repeat with remaining pork and puff pastry. Place in oven and cook 25 to 30 minutes, or until golden brown on the outside. note 1 - panko breadcrumbs are easy to find in most supermarkets. They are mostly likely to be in the baking section. note 2 - puff pastry comes in different sizes in different countries. I used puff pastry that was 10" x 15". That would be 25.4cm x 38.1cm for my Australian friends. Either way, you should end up with two even sized pieces around 5" by 7.5". This may vary in Australia. Join the discussion! What’s your favourite party food? What are your holiday plans this year? These are scrumptious. I am so glad that they come together easily too! I can see them in our near future, possibly for after Thanksgiving breakfast:) I’d MUCH rather be making and enjoying these rolls than participating in Black Friday, lol. Pinned! Thanksgiving breakfast would be perfect! they’re so easy to make! ha I will never understand Black Friday over here. I’d much rather be outside doing something active or cooking in the kitchen! You should totally be smug about these. I love the idea of goat cheese with the cranberry..mmmm!! PS – your joke about rolling it down the hill gave me a giggle 😉 Cheers! Here’s an appetizer I can’t eat just one of. It’s hard to separate me from puff pastry, especially savory stuff. The addition of goat cheese is the cherry on top. This crowd pleaser is coming to my next party. I am exactly the same, total sucker for anything puff pastry!!! Oh the wonderful combinations and flavors happening in this. Love pork and cranberry and love goat cheese and sausages but never tired them all together. Sounds yum. These look like the perfect, savory little appetizer for the holidays! I want to make ASAP, and they’re totally going on the list! thanks Kelly! Let me know how they go! These look amazing and I would actually go ahead and serve them as an appetizer for Thanksgiving alongside a small side dish of cranberry sauce, of which I just always make way to much! Win-win! thanks Kiki! omg they’d be awesome with cranberry sauce! Oooh, yes!! I love when you get a recipe right on the first try! This looks awesome! it’s the best feeling ever hey! ha thanks Michelle! It’s something I have to explain a lot to people! I’ve never heard of sausage rolls but they look delicious. Reading over the ingredients I know our whole family would be nuts over having them as an appetizer. It certainly looks like it would be the ideal party food. With the holidays coming up this is one handy recipe to have. omg Marisa you have to try them! Sausage rolls are amazing!!! thanks Veronika! They’re great because you can make them ahead of time! the cranberries give it a real Thanksgiving feel! 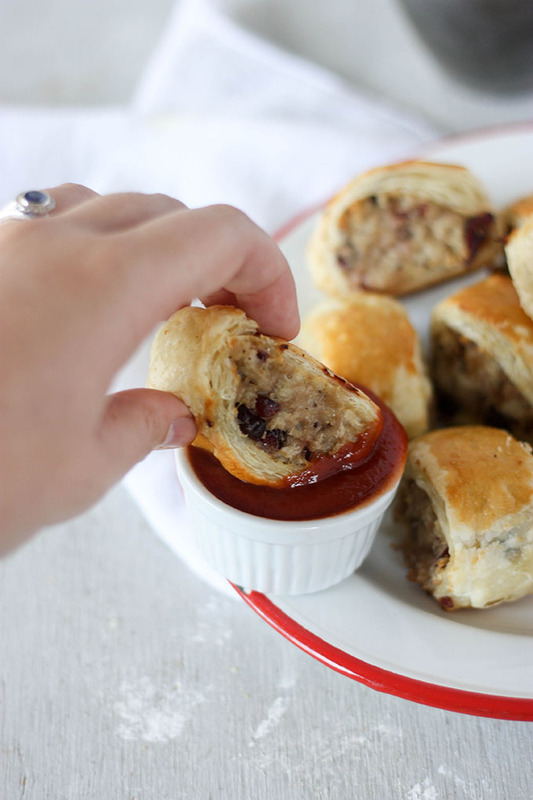 These Pork Sausage Rolls are the perfect party appetizer. They look so tasty! I am definitely going to make these for my next dinner party. they make a great appetizer! These would make a great appetizer option for every game day! I love the cranberry flavoring in them they are perfect for Thanksgiving too! perfect for game day! and they can be made ahead of time too! One of my earliest memories is being pushed along in my stroller, eating a sausage roll from the local bakery and covering myself in pastry flakes. The addition of cranberry and goat’s cheese sounds delicious. that’s so sweet!! we used to eat them in the car and leave pastry everywhere ha ha! You stated that these can be made ahead! Would you freeze them raw or cooked and would you thaw before cooking or reheating? Having big party and need to get big head start! Hi Mary! Yes you can make them ahead! I would cut them, then freeze them raw without the egg wash. The best way is to keep them in an air-tight container, and layer them in between a piece of parchment paper so they don’t stick together. You would reheat them from frozen. Prior to putting them in the oven, brush the tops with an egg wash, then follow the recipe directions for cooking, but I would add an additional 10-15 minutes to the cooking time. A best gauge is to test the middle with a meat thermometer, it should read an internal temperature of 145F. The pastry still should be golden brown on the outside, and the middle should be nice and hot, not frozen! Let me know if you have any other questions!